Education and renewable energy go hand in hand. The energy revolution we’ve seen the last few decades has come about because of some serious education and re-education of the public. If humans plan on sticking around awhile, growing an awareness of sustainability is as important today as acquiring skills in math, history and language arts. Bishop O’Dowd High School believes in these principles. This private school in Oakland, Calif., wants to help create a sustainable environment as part of its mission, with an emphasis on resource conservation, respect and learning from nature. These lessons pop up both in its curriculum and in its operation. The school has a Center for Environmental Studies, two plant propagation centers and even a director of sustainability on staff. 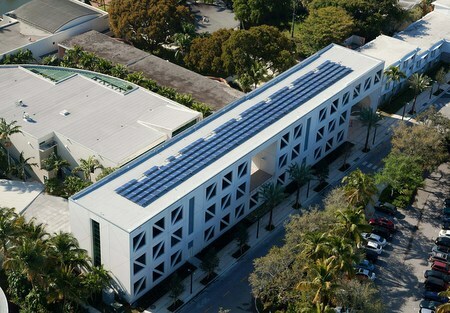 The center has been awarded the highest Leadership in Energy and Environmental Design (LEED) certification possible. The school’s overall aim is to reduce greenhouse gas emissions to close to zero by the year 2025. Since the school is located in California, saving water is also hugely important, so the school is cutting its water use by replacing grassy areas with artificial turf or drought-tolerant plants. 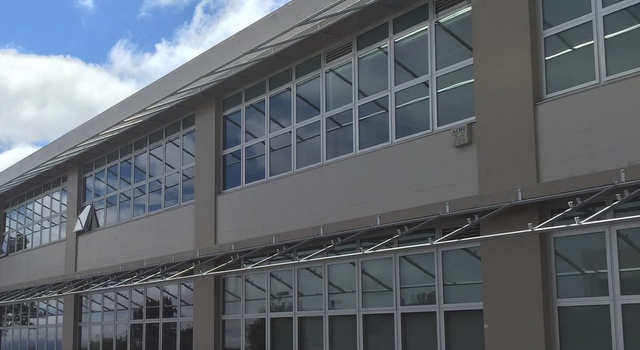 Despite all of these forward-thinking initiatives, Bishop O’Dowd had a problem: With a two-story building facing southeast, the classrooms get too hot during the day, causing students to lose focus. The sun also shines a glare that makes seeing the fancy new audio/visual equipment a struggle. At that point, some schools may just put in air conditioning, but AC would require a new electrical plant as the current one is 60 years old. Also, an investment there would take away from the school’s long-term goal of adding PV (Malmgren’s estimates show that this project would cost 10 percent of what an AC overhaul project would have cost). “We have been trying to install PV for years and could not make the numbers work because of roofing replacement costs, etc.,” Malmgren says. The eventual solution is almost too obvious: Kill two birds at once and add awnings made of solar panels. John Orfali, a solar installer who worked with the school on a system for its Center for Environmental Sciences, said they started thinking about this project two years ago. 1. Lower the interior temperature of the classrooms by shading and cooling the heat gain in the concrete walls to avoid AC in all classrooms. 2. Lower the light infiltration around the interior shades to allow better projection of the electronic curriculum during the low morning sun angle cycle. 3. Optimize the use of the structural support for a dual purpose to accomplish both the shade and PV electrical production, eliminating the roofing/shade component. 4. 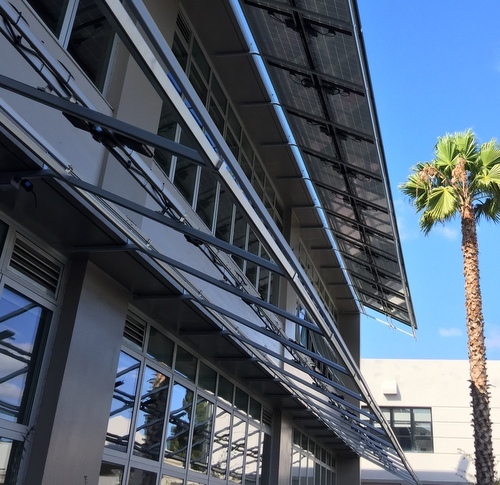 Use the exposed components of the shade and PV as a visual educational tool as part of the school’s sustainability program and commitment to the health of the environment. 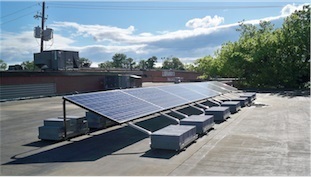 The 198-panel system is generating close to 250 kWh, which could save the school about $15,000 per year. As they kept searching for the perfect solution, they found one at an architecture firm that had designed their own and installed it on their building. Using that as their model, Orfali and Malmgren had to go design something unique. Fratessa Forbes Wong Structural Engineers of Oakland, Calif., were the structural engineers for the awning structure design, and they contracted a manufacturing firm to create the awning structure. The thing about Malmgren is he’s not your typical school facilities director. He previously worked for NASA, and he was behind the plans for the awning’s target temperature reduction, the expected return of energy from the PV system and the return on investment of those two attributes working in concert versus the costs/benefits of installing a new AC system. “Trying to solve two problems, I commissioned Integral Group to design an engineering study to determine the effect of shading the building walls to lower the stored latent heat in the classroom walls,” he says. “We also did a shade angle study with Sketchup to make sure the shade would block the light infiltration around the interior shades to allow better projection of our electronic curriculum during the low morning sun angle cycle. “We determined, in theory, that we would lower the classroom interiors by 5 to 10 degrees F by adding shading,” he continues. 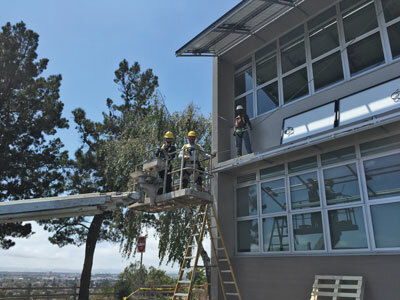 The project officially came to life in April, first as a 28-panel prototype attached to the hottest two classrooms in order to test the system architecture and the calculations for reduced heat and glare. The prototype was a success, which green-lighted the full project over the summer. “It’s interesting because the project reduced energy consumption while producing it. The multifunctional aspect of it is very exciting,” Orfali says. That’s really what, we assume, won the hearts and minds of voters for this year’s Rooftop award. Solar power generation is a great way to produce renewable energy, but being able to also reduce the total amount of energy that a given building needs to produce to cover usage in the first place, is perhaps an even nobler accomplishment. This is especially true in California due to Title 24 energy efficiency standards, which are focused on reducing the state’s overall energy consumption. The success of these standards and other energy efficiency efforts is a significant factor in California’s per capita electricity use remaining flat over the last 40 years while the rest of the country’s use continues to rise. In 2008, California set bold energy-use reduction goals, targeting zero net energy (ZNE) use in all new homes by 2020 and commercial buildings by 2030. 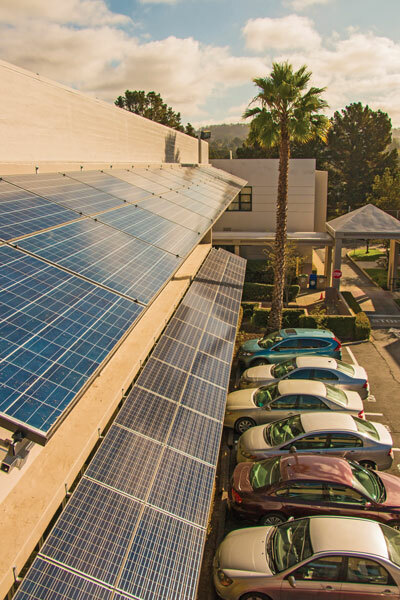 The ZNE goal means new buildings must use a combination of improved efficiency and distributed renewable energy generation to meet 100 percent of their annual energy need. So, that’s the environment in which Bishop O’Dowd operates, where any additions or upgrades need to take all of this into account. Now that the system has been up and running, we can see the impact in real time thanks to the microinverter communication system Orfali installed. When Orfali checked for us over the phone on a random day in October, the 198-panel system was generating in full close to 250 kWh. At 15 cents per kWh per day, producing 250 kWh a day, Malmgren expects a savings of about $15,000 per year, which would pay for the system in about six years (which doesn’t include the savings achieved by not having to install and run AC). 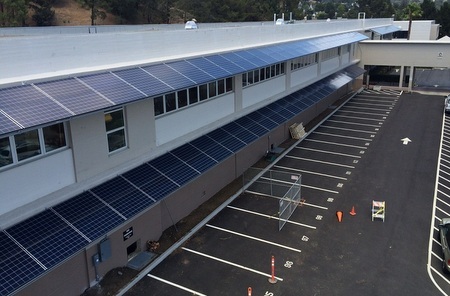 Thanks to some innovative designs and forward-thinking, this Project of the Year will help Bishop O’Dowd try to achieve its zero-net-energy goal by 2025 and also provide a better learning environment for its students.